It is said that you only have one chance to make a first impression. Our unique wooden business cards are enough to make people remember you! 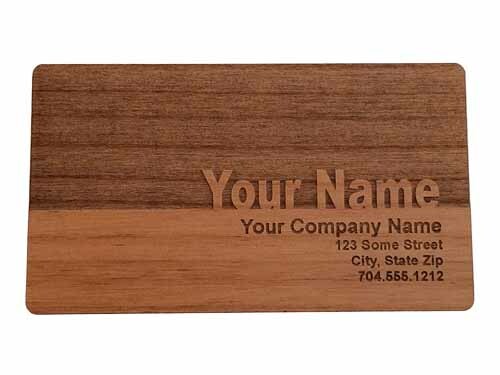 Each standard sized wooden business card is expertly laser cut and engraved in your choice of either premium alder or maple wood. Each is one-of-a-kind -- they are stunning! You will receive 8 Wooden Business Cards in the wood type and design of your choice. You will receive 24 Wooden Business Cards in the wood type and design of your choice. You will receive 56 Wooden Business Cards in the wood type and design of your choice. Have you ever been to a conference, job fair, or trade show and collected hundreds of business cards from those you met? Have you ever had trouble remembering just who it was that handed you their card? Would it be safe to assume that others have the same difficulty connecting you to your business card? 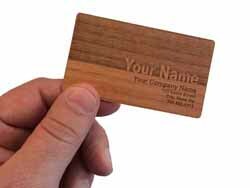 Our wooden business cards have been proven to be much more effective than regular paper business cards. 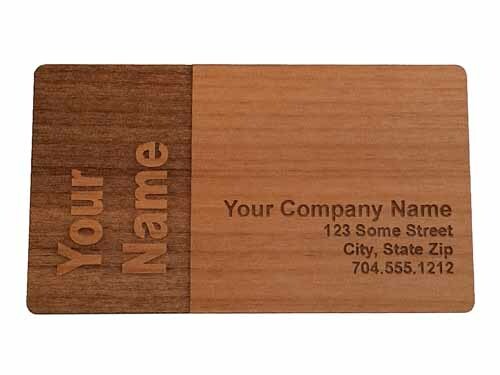 Each laser engraved wooden business card is a unique work of art that is practically guaranteed to generate in the moment conversation. 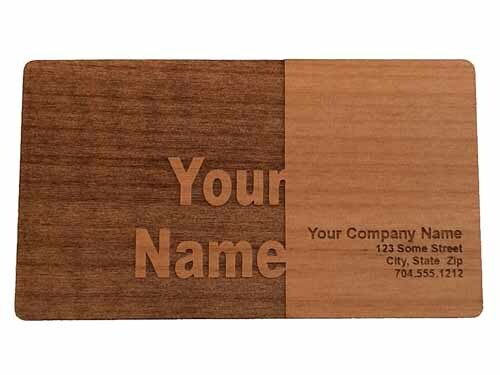 Your wooden business cards will generate more callbacks, and leave a lasting impression with those you give them to. I must admit that I was initially a bit put off by what I perceived to be the high cost of these business cards. As it turns out, they are worth every penny! I have reordered three times and will continue to do business with your company. The fast shipping and accommodation of my design modifications is greatly appreciated! Fantastic product! Fantastic company! Keep up the great work! Q: I've just placed my first order for 24 business cards. On re-order, will you have the art on file from this order archived? If so, how long will you be keeping my art on file? A: Hi Mitch - Thanks so much for your question and for your order! We will absolutely have your art on file for you when you need to re-order your wooden business cards. We keep all project art on file for a minimum of 24 months. Please let us know if we can offer any additional information. Thanks agan, Mitch!